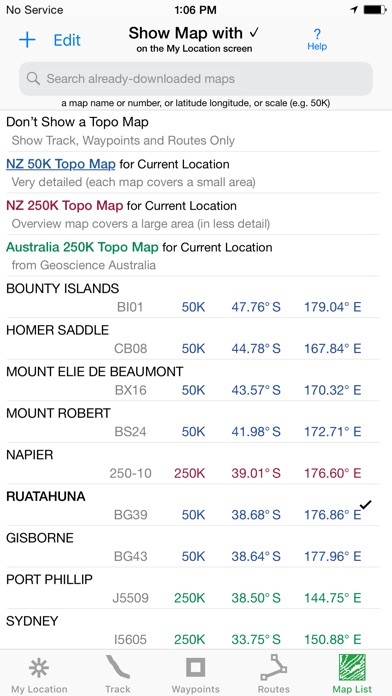 Your iPhone or iPad becomes a superb GPS receiver with New Zealand and Australia topo maps, even where there is no cell signal! Headed into the wilderness? Buy this app now so you will always know where you're going, where you are & where you've been. The highest quality track recording, the best route navigation, & the most accurate Estimated Time of Arrival of any available tramping app. No sign-up, ads, subscription or in-app purchase required, making this less expensive & less hassle than the “free” or subscription apps. Use for tramping, biking, backpacking, canoeing, kayaking, geocaching, hiking, trekking, skiing, camping, sightseeing & 4WD exploring. TRACKS, WAYPOINTS & ROUTES Record a track as you walk, even in the background. View it on the map. Trip Timer & Odometer. 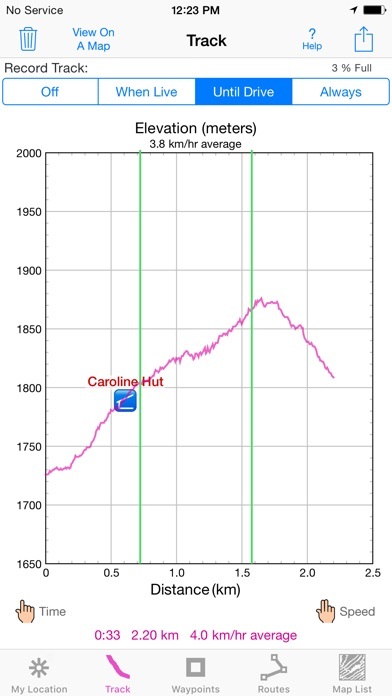 Show an elevation graph of your track or a route with altitude data. View date, time & average speed of track points. Display the area inside a closed path. 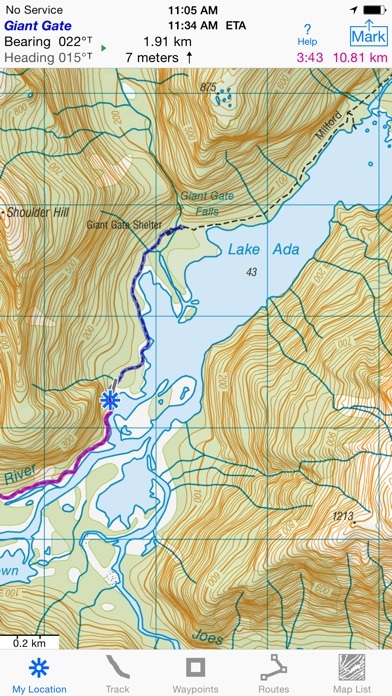 Mark waypoints by their position on a map, by tapping a geotagged photo, by projecting from a known point, or by searching place names including huts. Choose from a selection of waypoint icons. Refine a waypoint position when you arrive. Set a quick GoTo waypoint or a full route & see the heading, direction, distance, elevation change & Estimated Time of Arrival at your destination & intermediate waypoints along the trail. Create routes using waypoints, recorded tracks, or imported GPX or KML files. Advanced route editing. Export GPX & KML waypoint, route & track files via eMail, Messages, Copy To, AirDrop, iCloud Drive, Dropbox or iTunes. Send KML files to display immediately in Google Earth. Receive KML files from Google Earth. FOREVER-FREE TOPO MAPS Official Land Information New Zealand (LINZ) 50K & 250K scale maps, including NZ off-shore islands. 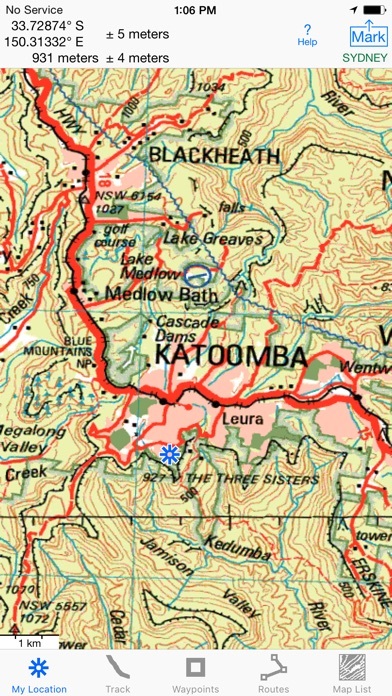 Official Geoscience Australia 250K scale maps. (No smaller scale maps for Australia). Stitches beautiful richly detailed high resolution offline topographic map images for seamless coverage across map boundaries. Store a few maps or all maps for both countries to use anytime in the wilderness without cell service. Maps from our server have a shorter download time and use less of your monthly data allotment. Includes map legends. 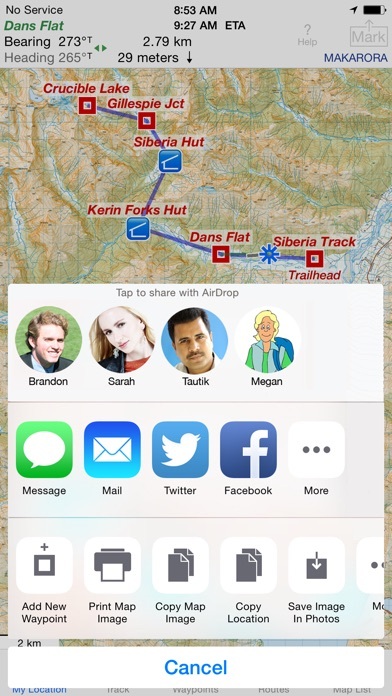 Print and Share map images overlaid with waypoints, routes & tracks. Measure distance between any two points. USE THE UNITS YOU PREFER Kilometers, Miles, or Nautical Miles. Meters or Feet. Degrees, Degrees/Minutes, Degrees/Minutes/Seconds, UTM, or NZTM2000 grid. °True or °Magnetic. HOW TOS Tap Help in the App. Online Manual on iHikeGPS.com/nz Follow on Twitter: @iHikeGPS Email developer: lwjames@iHikeGPS.com WHAT OTHERS SAY “This app saved my life! * * * * * This app was downloaded, while lost in the Kaimai Ranges. 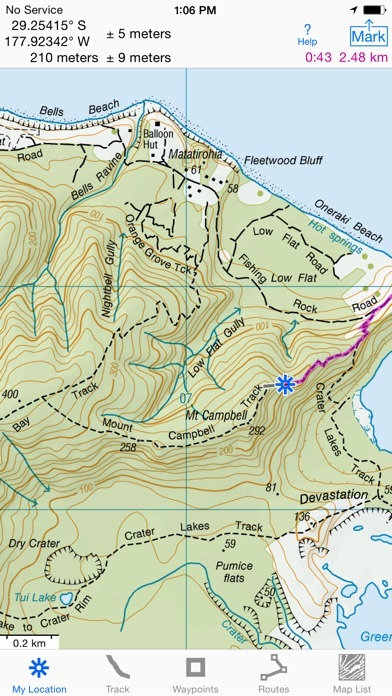 GPS quickly located position, app quickly (ish) downloaded the relevant NZ topo map. From there easily identified position on the map. Outcome, life saved. And my mates who by this stage was getting all girly about it all. Best app ever!! !” - Jk9624 on the UK App Store “I have used your ihike app for many years tramping in NZ.It is fantastic and absolutely the best off line navigation app out there.” - Paul, a internationally-known documentary film maker in Wanaka ,New Zealand DEVICE REQUIREMENTS No device requires a cellular data plan to use iHikeGPS NZ. Recommended: the iPhone 4S or later, & the 4th or later generation iPads with WiFi+Cellular support full navigation. Usable: the iPad 2 & 3rd gen iPad with WiFi+Cellular support everything except for map stitching. The WiFi-only iPad 2 & later, and the iPod touch (5th gen) & later require an iOS-compatible external GPS receiver to show your location in the wilderness and to record tracks. 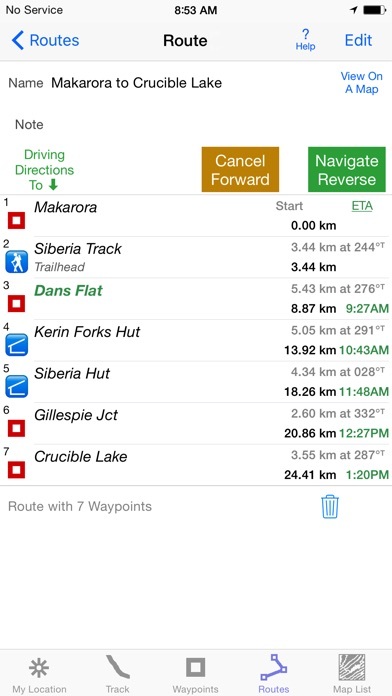 View maps using the iOS device alone. Continued Use of GPS running in the background can dramatically decrease battery life. Your dream of tramping adventures reaches new heights with iHike GPS NZ!